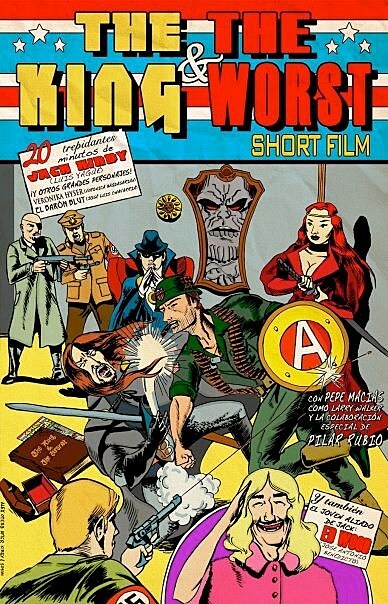 There are a lot of great team-up stories out there, but in his 22-minute short film The King and the Worst, director David Galan Galindo has brought us one of the most unexpected and awesome pairings of all time: Jack Kirby and Ed Wood, plucked from World War II to battle against a pair of evil sorcerers in a nightmarish dimension that looks an awful lot like someone's house. And as though that wasn't enough of a crossover, the Phantom Stranger shows up, too. Check out the full film after the jump, but be warned: There's some NSFW subtitles translating the Spanish dialogue! I think it's fair to say that The King & the Worst is only loosely based on the lives of Kirby and Wood -- both of whom actually did serve in World War II -- but what it lacks in plausibility, it more than makes up for in fun. It's completely bizarre, but in a way that's purely entertaining. Honestly, "Ed Wood and Jack Kirby team up to battle against the daughter of Baba Yaga" is a story I never knew I wanted until I saw it, and now I'm not sure how I lived without it. Also, now that I think about it, that's kind of a fair description of those early Hellboy stories. One of the more interesting things about TKATW is the mention at the end of Kirby and Wood meeting two more times in their lives, and I'm not sure whether that's a reference to something that actually happened or if it's Galindo planting the seeds for a sequel. Either way, it's something I'd definitely be interested in seeing. At the very least, the possibility of a cosmic-powered Tor Johnson is just too great to not exist.